Hi Pamela, could you please introduce yourself? My name is Pamela and I do Marketing and PR for a fine dining restaurant group. What do you like about Goldilocks? Goldilocks is different from other jewellers as they encourage individuality and creativity. The more you want to push the design boundaries, the happier they are to make your dream come true. As a result, you get a piece that is distinctly you. 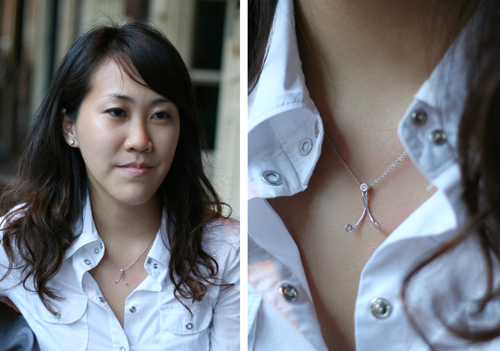 You chose to custom make a wishbone rather than a name or word. 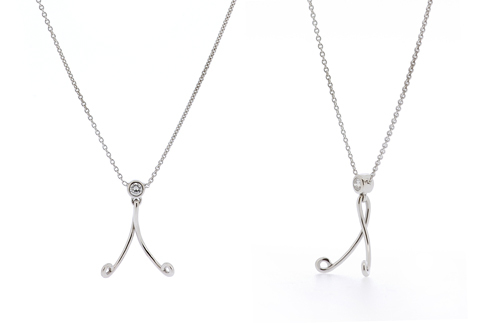 What does the ‘wishbone’ mean to you? When you have a wish, you also have hope. And that’s very important to me in a world where everyone is increasingly cynical. Do you get comments about it from other people? What do they say? Yes I do. They always ask where I got it from and compliment the uniqueness of the pendant. What other shapes or symbols would you like to see from Goldilocks™ in future? Unconventional ones that are not commonly found on the market.